Together, Vivos company and their client’s have created a healthy communities. Communities, where physical bodies and mental outlooks have been transformed for the better. Fostering an environment where “doing enough” is not just good enough but is appreciated. We empower your employees to fuel your company. I have been working with Oakley for over 5 years now. Last year around July, I went for my annual checkup at O Positive (our onsite health clinic) and my results were horrible. My numbers were out of range on pretty much everything (high LDL, low HDL, high triglycerides etc). In addition I was knocking on the doors of being diabetic (My A1C result for last 3 months average glucose level was 6.4 and anything >6.5 is considered diabetic). Our nurse practitioner was very upfront and she highly encouraged me to change my lifestyle completely. In addition to changing my diet, I also committed to attending the Crosscamp and Yoga classes offered hereat work during the lunch hours. I really felt that Nicole and the other VIVOS coaches were excellent teachers and they motivated us every day to become better and lead healthy lifestyles. After going to the classes every day, I went for a 3 month follow up blood checkup and astonishingly all the results came back normal! I would say that the fitness classes played a big part in how much I have improved both physically and mentally. The classes are one of the big reasons I look forward to coming to work every day. In addition, I talk to other colleagues in the classes and most of them have similar positive stories to share. I was one of the only employees in my department who used to go to the classes but now I regularly see 6-8 people from my team in classes and they are also seeing the positive difference it is making in their lives! Nicole Regan, owner of VIVOS (formerly Yoga 4Hire) is Oakley’s fitness consultant. She helped create our fitness program and keeps things running smoothly. 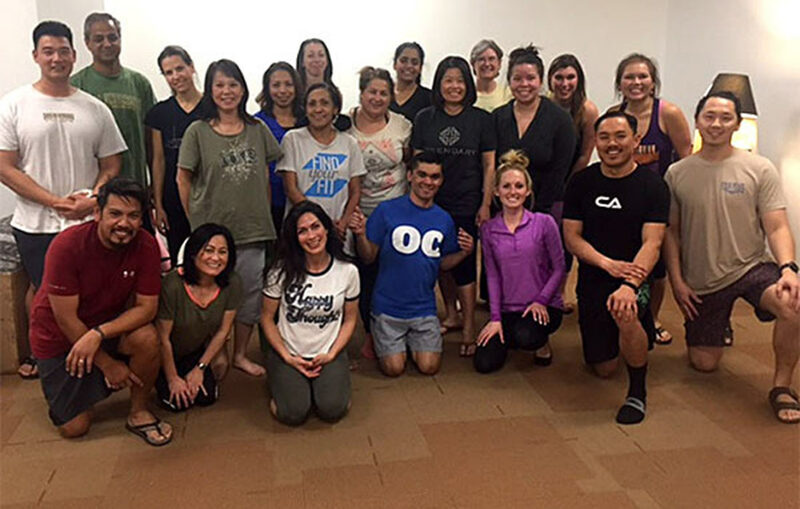 Not only does she instruct some of our classes (with rave results) but she finds inspiring instructors who always lead safe, fun fitness classes like Crosscamp, Kickboxing, Zumba and more. Nearly two and a half years ago we began with two yoga classes a week and held them in our cafeteria. The classes were so popular that we eventually added ten additional fitness classes and created a dedicated space to host them. VIVOS’s program has brought new life to company morale. People come out of classes feeling better about themselves, working along side one another with a deeper sense of cooperation and a sincere appreciation for the benefits they receive at Oakley. During our talent searches, mention of our fitness program brings enthusiasm and interest in working at Oakley. The cost for VIVOS has been a small investment for the employee satisfaction it brings. I’ve been doing the offered yoga classes here for roughly the past year and a half. Around 3-4 months ago I added in the mid-day CrossCamp classesas well. And I’d just like to say that I feel the best I have felt in probably ten years. These fitness classes are such a great benefit, and I just want to pledge my support to continue the efforts. Everyone that takes the time to be a part of them enjoys them as well. It’s also been such a great way to break down silos. I’ve met, and talked about work, with people that I would never talk to otherwise. No complaints, just some positive feedback that I, and many others, really appreciate the benefit. Thanks! We have partnered with VIVOS since 2015 and have had VIVOS attend our Division Health Fair each year to educate our employees on the benefits of healthy lifestyle habits. The employees absolutely love and look forward to the quality of the VIVOS classes each week. The employees are grateful for the program because it has improved their quality of work-life balance. As the employer, our division is grateful for the program and anticipating positive trends in employee engagement as well as reducing absenteeism and health care costs. HR is also able to share the benefit of on-site weekly classes as a recruitment tool when branding Bio-Rad as a company of choice. The feedback we receive has always been positive and the instructors ask the employees attending what they are hoping to gain from the class and adjust accordingly! These companies, along with others VIVOS clients, have enjoyed a creatively charged and uber-appreciative work force.